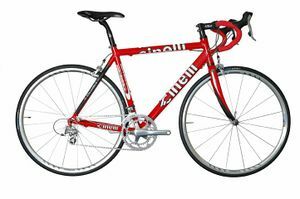 Cinelli is an Italian bicycle manufacturing company based in Milan, Italy, producing mostly road bicycles and components. 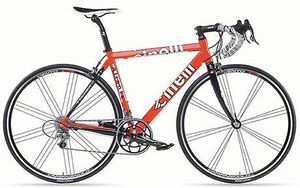 Cinelli has a reputation for quality in design and production similar to Italy's other famous bicycle marques. Some may remember him for his cycling career, many for his great gifts given to cycling, the modern handlebar, the first saddle with a plastic frame, the first foot clips, the first quick release pedals. Competition is always in the Cinelli’s DNA. Its handlebars are chosen by Champions such as Lemond, Fignon, Hinault and Chiappucci, without forgetting Lance Armstrong and Mario Cipollini and also Di Luca, Freire and Simoni. Cinelli’s Rampichino (1985) introduce MTB in Italy, Cork Ribbon (1987) reinvents the bicycle ribbon, Spinaci extensions (1996) are used by over 800000 cyclists, Bootleg (2000) challenges the rules and reinvents the concept of street cycling, Ram (2002) revolutions the handlebars. These are the roots of Cinelli, this is its present: today Cinelli is mentioned in the Dictionary of Italian Design (Rizzoli, 1999), in the ADI Design Index (2000-2001), and the Corriere della Sera newspaper calls it a cult object in the USA like Ferrari, Vespa, Lavazza or Fornasetti (9th January 1999). 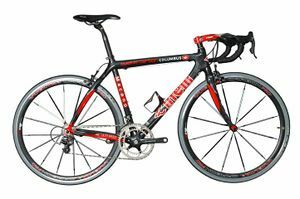 Since 1997 Cinelli is a division of Gruppo SpA and together with Colombus forms a world recognised production pole in the top level cycling industry. Unicanitor saddle (1962) The first plastic-bodied saddle. M71 Pedal (1971) The first quick release clipless pedal. Laser (1980) Track pursuit and time trial model which pioneered a new aerodynamic aesthetic and TiG welding in bicycle frames.